Our travels in 2012 would include a trip through the legendary Rideau Canal, formally designated as a UNESCO World Heritage Site in 2007. Since our Lois McClure outreach program began, I had heard much about the Rideau Canal. Always described in superlatives, the Rideau Canal was completed in 1832 and was described as still mostly in its original “as built” condition. When visiting Ottawa, I vividly remember seeing the flight of Rideau’s eight stone locks ascending from the Ottawa River to begin the inland journey to Kingston some 124-miles to the south-west. The connection I had never made prior to preparing for our current outreach program was the profound linkage between the construction of the Rideau Canal and our “1812: Commemorating the War, Celebrating the Peace” interpretive program. The Rideau Canal was conceived and built in the immediate aftermath of the War of 1812 and reminds us of the hostility that once existed between Great Britain and the United States. After the peace agreement negotiated at Ghent was ratified there was still a real expectation that hostilities would continue and that another conflict between Britain and the US was imminent. British war planners in Canada had heightened concerns that in a future war they could be at a serious disadvantage using the St. Lawrence River to send supplies and troops to Upper Canada and the lakes. Here the Americans working from a fortified New York State shoreline could impede or shut down the strategic resupply route and so an alternative option was put in motion. Surveys were authorized to determine if an alternative route between the Ottawa River and Lake Ontario could provide a feasible alternative. Beginning at the Rideau River where it entered the Ottawa River, the goal was to utilize a series of interconnected lakes to reach Kingston on Lake Ontario. 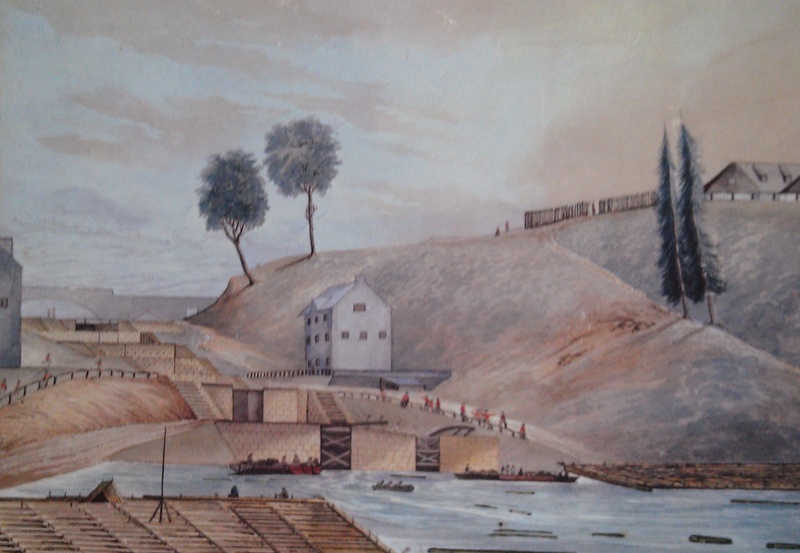 The early surveys proved positive enough and British war planners ordered Lieutenant Colonel John By of the Royal Engineers to travel to Canada in 1826 to take over the project and superintend the work of building the strategic new canal. Lt. Col. By proved to be the perfect man for the job. After By’s arrival from England he examined the proposed route and with fresh eyes refined the placement of dams, locks and channels suggested by previous engineers. The most profound suggested change, however, involved making a strong case for expanding the size of the locks to accommodate steamboats in place of horse drawn power. In this radical departure to incorporate steam-power as the primary-power for boat movement through the canal, Lt. Colonel By was ahead of his time. To accomplish this goal he had proposed the locks be expanded to 150 feet long by 50 feet wide and 10 feet deep. Although he did not convince his superiors to expand the locks to this full-extent, he was successful in expanding the locks, many of which were already under construction on the reduced size, to 134 feet long, by 33-feet wide, with 5-feet of water over the sills. At this new size, the locks were sufficiently large to accommodate the steamboats of the day and the towpath, so central to the other Canadian canals, as well as Erie and Champlain canals, was not present. This gave the Rideau Canal the distinction of being the first canal in the world engineered for the new transportation technology. 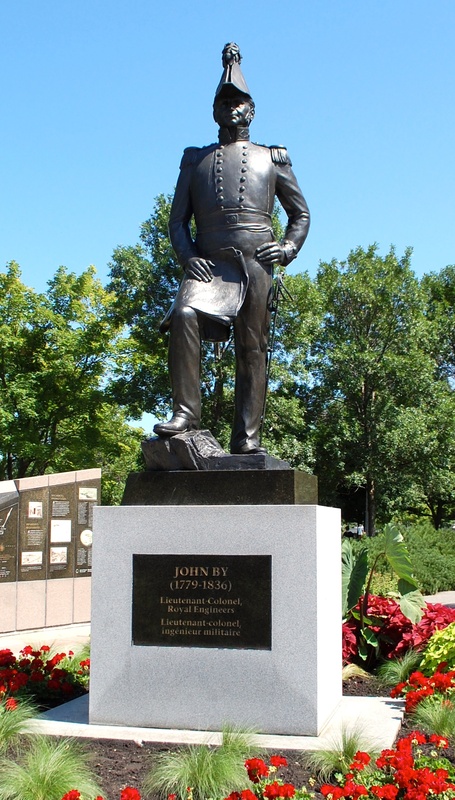 Over the next 6-years, John By overcame every conceivable difficulty and obstacle and in 1832 the new 124-mile canal was completed from the Ottawa River to Kingston. The new canal, built more for military than commercial purposes was completed with blockhouses, defensible lock-masters houses and the active presence of military barracks ready for the next war between Great Britain and the US. One of the important and positive observations we can make in 2012 is that that conflict never came and by 1850’s, the military gave up control of the Rideau canal to civilian authorities as Great Britain, the US and Canada embarked on two centuries of peace, growing economic interdependence and cultural connections. Another By-product of building the new Rideau Canal was the establishment of a new settlement at the entrance to the canal on the south side of the Ottawa River. The southern shoreline of the river where the Rideau River entered in a magnificent waterfall’s in a very sparsely populated area. Meanwhile, the community of Wrightstown on the north shore was flourishing. Lt. Colonel By’s selection of the “Entrance Valley” to locate the first flight of locks and erection of workshops, hospital and headquarters for the enterprise created what would become known as Bytown and later Ottawa. The stone Commissariat building erected to support the work still stands today as the Bytown Museum. Workers from Lower Canada, Scotland, Ireland and the United States streamed into the new settlement looking for work and with them came the full spectrum of suppliers of all that was needed to support the work effort and leisure time. Bytown became a frontier community with a reputation as a wild town and that reputation continued until the settlement transitioned into the new city of Ottawa and transformed from a raucous outpost into the gentile capital city of Canada. 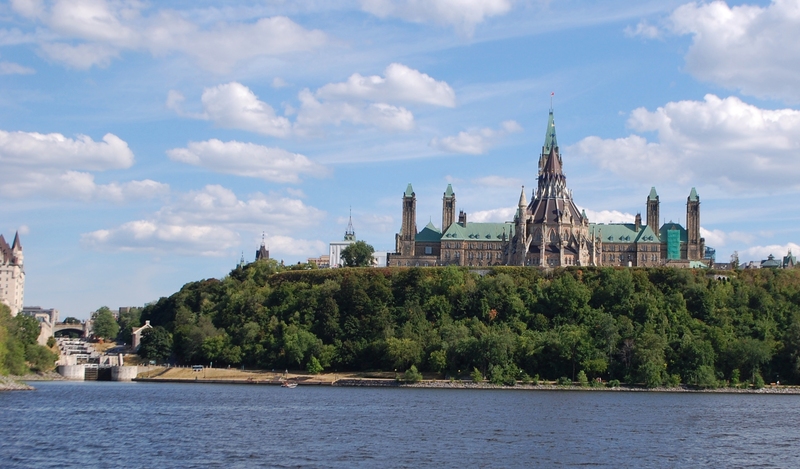 Ottawa became the nation’s capital in no small measure by the presence of the Rideau Canal. Lt. Colonel John By, dedicated public servant who provided the engineering skill, leadership and dedication to implement this challenging project did not fare as well. In May,1832, after completing a triumphant tour through the entire new canal with his family, Colonel By was recalled to England to answer questions about the canals expense. Instead of the hoped for Knighthood and recognition for his accomplishments, Lt. Colonel By suffered from second guessing by people unfamiliar with the project and he died four years later a disappointed man. It is hard to imagine a more dedicated and effective public servant, and it has only been in the reflection of time that Lt. Colonel By has been recognized for his amazing achievement. The Rideau Canal today is very close to its 1832 “as-built” condition. The stone locks built by Lt. Colonel By have never been expanded and the twists and turns that challenged our canal boat were the same ones that caused our Captain Theodore Bartley to remark in 1886 that while the country was some of the most beautiful he had ever seen, “the little lakes[were] the most irregular I ever saw”. The flight of eight locks that takes you from the Ottawa River to the next level was is a marvel for its engineering achievement and sheer grandeur as a stone sculpture. The Lois and crew arrived at the bottom entrance late in the afternoon we spent that first night on wall just below the locks, the Canadian Parliament and the Bytown Museum. The next morning, with the assistance of our friends from Parcs Canada, we made our way up through the eight locks and up to Hartwell’s Lock, where a huge crane from Dulepka Equipment Rentals put our sailing rig up so that we might participate in the annual Rideau Canal Festival. Assigned a position at the head of Dow’s Lake, a former dense swampland which had created so many problems for the Rideau Canal engineers, we found ourselves in a beautiful boating basin. In company with our new friends from Pogo, the 36-foot, 1954 retired Canadian hydrographic survey vessel now used for on-water youth programs, over the next three days we participated in a nighttime boat parade, helped interpret that history of the canal, and related how the War of 1812 helped create the infrastructure still in place today. An opening celebration was hosted aboard the Lois McClure and Rideau Canal Festival supporters and government officials including Susan Crystal from the American Embassy and Royal Galipeau the Ottawa Member of Parliament attended. The next days were filled with incredible activity and visitation as extra help in the form of veteran interpreters Ernie Haas and Karen and Jim Gallott came to the rescue. We also received great support from Juan Sanchez and Stephanie Elliot from Parcs Canada who provided logistical support and interpretive coverage for this important stop. Being in Ottawa, our time off gave the crew opportunities to embark in many directions to eat, sightsee, shop and visit the cities many excellent museums. For me, one of the real highlights was a visit to the Canadian War Museum to view their new and excellent War of 1812 exhibit. The exhibit presents the war from the different perspectives of British, Canadian, American and Native Peoples. It was an excellent and thoughtful presentation that helped me to better understand the war’s complexity and geographic expanse. By the time the Ottawa stay was completed we had hosted over three thousand people aboard and were very gratified by the reception. The next leg of the trip would take us through the entire length of the Rideau Canal from Ottawa to Kingston. For many of the crew, this has been a highly anticipated centerpiece of the trip. However, before we could embark on the historic canal we first had to return to Hartwell’s Lock so our friends from Dupleka could help us take down the rig in anticipation of traveling the UNESCO recognized Rideau Canal that would transport us back into the time when the War of 1812 had recently ended and the next chapter anticipated was continuing conflict with the United States.